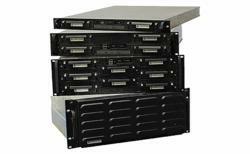 Core Systems' M-Raptor Series of rugged rackmount computers passes MIL-S-901D high impact shock tests in the highest levels of testing standards. The M-Raptor Series of rugged rackmount computers from Core Systems has successfully passed shock tests for MIL-S-901D, Grade A (mission critical) Class I (without the use of resilient mountings), as confirmed by an independent accredited testing facility. MIL-S-901D is a military specification for high impact shock on shipboard (Navy) systems, with Grade A referring specifically to items which are essential to the safety and continued combat capability of the ship, and Class I referring to equipment that is directly mounted to the bulkhead of the ship without the use of a shock isolated mounting system. Grade A and Class I are both the highest levels of testing standards in their respective categories. Core Systems' rugged computers were tested in the lightweight category. This requires that the Core rugged computers be placed on an anvil that is struck by a 400 pound hammer at hammer heights of 1, 3, and 5 feet respectively. The hammer test is carried out at each height on three different axis points for a total of 9 hammer blows. Chris Schaffner, President of Core Systems, said, "several manufacturers claim that their products are designed to meet MIL-S-901D. Anybody can make a claim, it’s another story altogether to actually pass a 901D test. Our [Core Systems] products are fully certified to the MIL-S-901D Grade A Class I specification. We mean it when we say they are built Core Tough.” Core Systems is proud to present the M-Raptor series of rugged computers to be compliant to the highest level of the MIL-S-901D shipboard military specification. Core Systems is a pioneer in the industrial computing field. Core Systems manufactures both custom and COTS solutions for the industrial, embedded and military computing marketplaces. Products offerings range from rugged industrial computers and rackmount LCD s to complete custom designed systems and multi-panel display consoles. Core Systems is trusted worldwide to deploy best-in-class rugged computers and displays. Visit http://www.coresystemsusa.com for more information.